This initial post was originally written up after doing 2700 cycles - updated information as more cycles were completed has been added to the bottom of this post. As a follow on to my previous cycle testing of Eneloops (and other NiMH cells) I decided to run a modified test on a pair of 4th Generation Eneloops – one made in China and one from Japan. Previous cycle testing results showed significantly less cycles in my testing compared to the results claimed by Sanyo/Pansonic, so I decided to run a test that was somewhat closer to the IEC standard testing method that they used. My aim with this test was to see if it is possible to achieve a similar number of cycles as claimed by the manufacturer. My hope was that limiting the depth of discharge and maximum charge level it would reduce the amount of wear and tear with each cycle. The results from this have exceeded my expectations by a huge margin. After 2700 partial cycles, the Japanese cell is holding up extremely well. 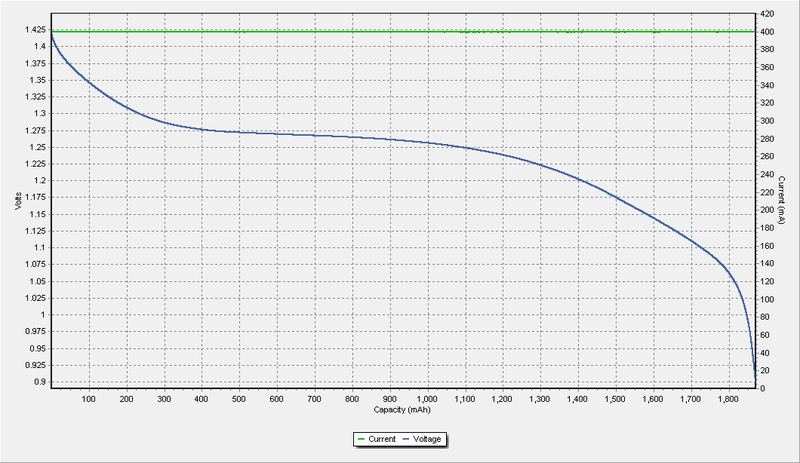 Partial cycle capacity has dropped somewhat but has plateaued at around 900 mAh. 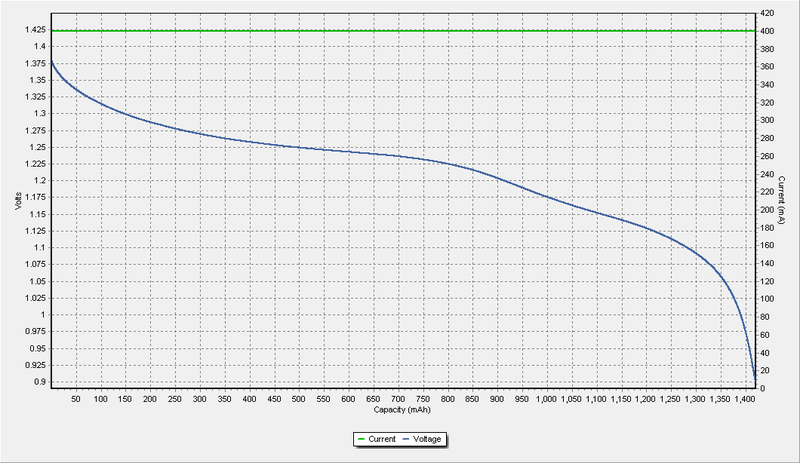 The full discharge cycle is still showing a very respectable capacity of around 1,730 mAh. Cumulative discharge capacity is now up to 2,870 Ah – equivalent to a total of about 1,450 full cycles which I think is quite good considering how well it is still performing – internal resistance is currently running at around 35 milliohms – less than the resistance of the Chinese made Eneloop when it was brand new! The Chinese made Eneloop isn’t fairing anywhere near as well as the Japanese made Eneloop. 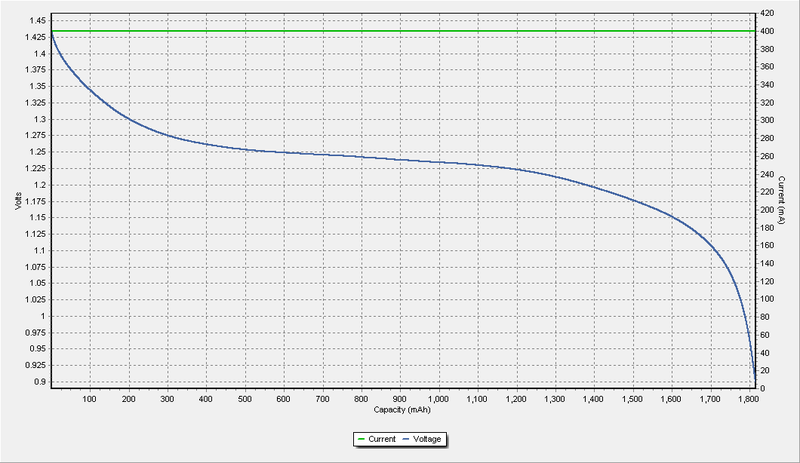 Fast discharges are now down to around only 250 mAh and is continuing to slowly drop off. Slow discharge cycles are still showing a reasonable capacity of around 1,400 mAh. The capacity of this cell is actually significantly higher than this - after 2100 cycles, I put it through a series of 3 full charge and discharge cycles and got a final capacity of around 1,830 mAh. What is happening with the normal slow discharge is that the 1.44V charging cut off is now so low for this cell that even with a 600 mAh top off, it’s still not getting a full charge. It appears that the 3 full charge/discharge cycles have temporarily improved the capacity of this cell, but they may have also triggered an increase in the capacity decline at fast discharge rates – slow discharges have plateaued however. Internal resistance for this cell has more than doubled from about 50 milliohms up to around 110 milliohms. 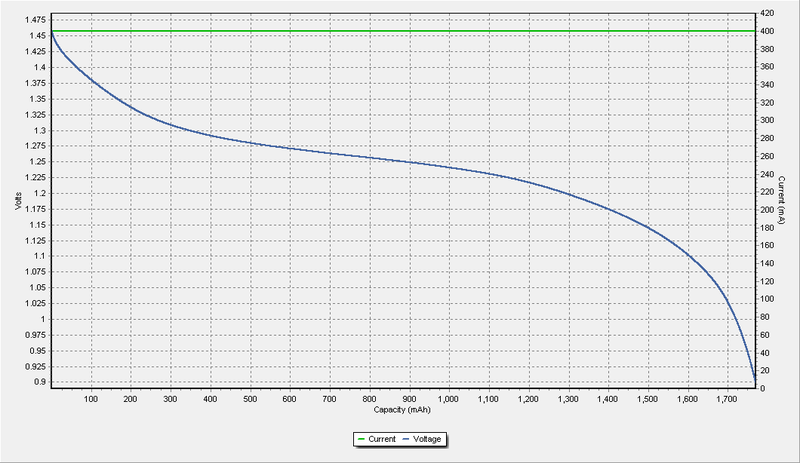 Cumulative discharge capacity is now up to 1,930 Ah which works out to be equivalent to about 1,000 full cycles. The partial discharge capacity of this cell is now so low that I’d consider it to be nearly useless for most applications. No doubt, if I was to raise the charging cut off, the useable capacity would be significantly higher, but I would expect that this would only hasten the overall decline of the cell. Despite putting up a poor effort compared to its Japanese made equivalent, it’s still performing considerably better than I’ve seen with the other testing that I’ve done. An interesting observation with this test is that after the first 49 partial discharges, the first full discharge showed slight but noticeable voltage depression (aka memory effect) on both the Chinese and Japanese Eneloops. Below is a graph of the 50th discharge for the Chinese Eneloop – the Japanese Eneloop discharge curve looked much the same. After this, I ran the Chinese cell through a series of 3 full charge/discharge cycles. The voltage depression was pretty much gone by the first of these cycles and was pretty much undetectable in the following cycles. Capacity improved slightly with the 2nd cycle at 1830 mAh but remained constant for the 3rd cycle. After 2100 cycles, I also ran the Japanese Eneloop through a single full charge/discharge cycle. Voltage depression wasn’t obvious on this cycle and capacity came out to 1770 mAh which was actually lower than the Chinese Eneloop. It should be kept in mind however that the Japanese Eneloop started with slightly lower capacity and has been through a lot more effective cycles. Looking at the first chart, it appears that the full discharge done every 50th cycle helps with the fast discharge capacity – most likely due to erasing most of the voltage depression. It would be interesting to see what would happen if no slow discharges were being performed – it may be the voltage depression would get to the point where there was virtually no useable capacity available before the cell voltage dropped below 1.1V Conversely, it would be interesting to see what would happen if a full slow discharge was done more often – perhaps every 20 cycles. My best guess would be that the fast discharge capacity would be slightly improved, but it would cause greater wear and tear on the cells. It is well known that overcharging NiMH cells is bad for them. Although the chemistry is quite robust and won’t “vent with flames” like Lithium cells can when overcharged, overcharging is still not good for them and can lead to accumulated damage such as reduced capacity and increased internal resistance. Despite being quite robust, continuous overcharging at low rates can damage Eneloops quite quickly as demonstrated by testing done by others. It may be that charging a NiMH cell to 100% without actually overcharging it still does minor damage which can mount up over time, so limiting the maximum charge level to something like 80 or 90% may be beneficial for the long term health of the cell. Reverse charging a NiMH cell won’t kill it entirely, but it can cause reduced capacity and increased internal resistance relatively quickly. It may be that even discharging down to 0.9V which is normally considered to be safe may still cause minor damage to the cell and that keeping a reserve of 10 or 20% may also be beneficial for the long term health of the cell. Having no rest periods would at first seem counter intuitive if you’re wanting to extend the cycle life of a rechargeable cell – after all, the rest period allows the cell a chance to cool off which would seem to be good for the cell rather than running hot all of the time. I suspect that allowing the cell to cool off is actually not good for it, since it allows for thermal stress during the cooling and subsequent heating cycles and that may do damage to the internal structure of the cell. It may also be that sitting at 0% or 100% charge level for even brief periods of time may not be ideal for the cell. Lead Acid batteries in particular don’t like to be left in a discharged state for longer than necessary – if they’re left discharged for too long, their performance can be severely degraded. The same may apply to NiMH cells, but to a lesser extent. I have already started running more cycle life tests to try to determine which of the above factors plays a role in increasing cycle life – for one test, I’m fully discharging the cells to 0.9V, but only charging them back up to 1.44V. In the other test, I’m fully charging the cells (using inflection termination) but only discharging them to 1.1V. In both cases, the tests are being performed without rest periods. I suspect that stopping discharges earlier is possibly the biggest factor, although the other factors also probably have a role as well. It will be interesting to see how these results turn out to see if my suspicion is correct. Short or no rest periods. Charging (and discharging) at high (1C) rates. Allowing cells to reach 40 degrees C for extended periods during charging and discharging. When will this test finish? At this stage, I really don’t know! At the current rate of degradation, I wouldn’t be surprised if the Japanese Eneloop manages to exceed 5000 partial cycles and still keep going! I’ll aiming to keep this page updated at fairly regular intervals! These cells have now completed a total of 3200 cycles each. Not much has changed - their capacities have actually leveled off quite a bit. The Chinese Eneloop showed increased capacity for quite a few cycles, but that was due to a bad connection which reduced the maximum discharge current for those cycles. Total cumulative capacity for the Chinese Eneloop so far is now about 2,100 Ah - equivalent to over 1000 full cycles. The Japanese Eneloop has done a total of about 3,300 Ah - equivalent to around 1,650 full cycles! These cells have now completed a total of 5000 cycles each. For the most part, the trend has continued on pretty much as I expected. After 4200 cycles, I ran another slow charge/discharge cycle on both cells and that seems to have unlocked a significant amount of capacity for the Chinese cell during regular slow discharges. Total cumulative capacity for the Chinese Eneloop is now about 2,400 Ah - equivalent to about 1,200 full cycles. The Japanese Eneloop has now done a total of about 4,700 Ah - equivalent to 2,350 full cycles - significantly more than the advertised rating of 2,100 cycles (which is measured with only partial discharges, so this goes well beyond the official rating, and it still isn't dead yet!) 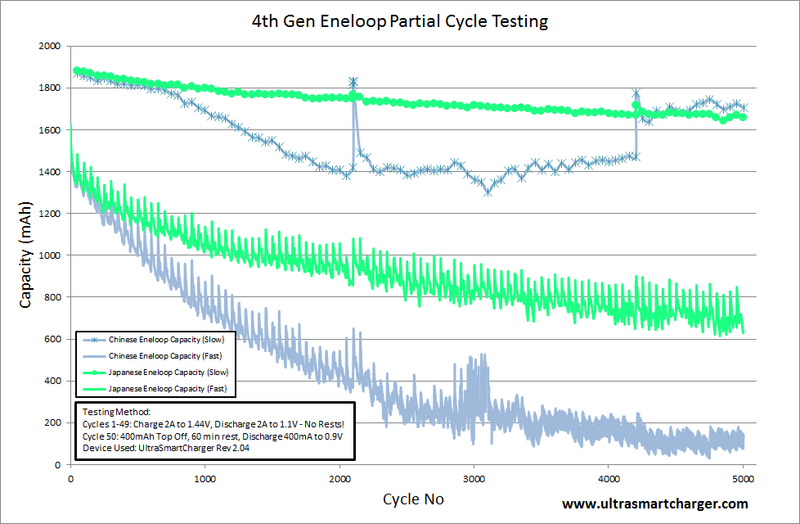 I suspect that this is the most cycled Eneloop ever - if anyone is aware of any cycle testing which has given more cycles on an Eneloop (or any NiMH cell) please let me know about it! These Eneloops have now completed 3200 cycles, so I've updated the chart and included an update in the first post. This test has now reached 5000 cycles, so I've updated the chart and added a new note to the bottom of the first post. whats the count at now? do you know the age of the cell? and the dedicated live webcam site? The cycle testing has now completed, but I just haven't had a chance to write up the results. As a preview, the Japanese cell managed over 10,000 cycles - but they were pretty shallow cycles by the end. Any results on these other two tests? Unfortunately, I haven't got around to analyzing the results on those tests even though the tests finished a while ago.